The air bombing and firing meant to retaliate on militants who hit the wedding gathering, killing 10 women, 23 children, and four men, all civilians. KABUL -- As many as 37 civilians have been killed in an airstrike of U.S.-led troops in southern Afghanistan while attending a wedding party, local Afghan villagers said Wednesday. The bombing started at 2 p.m. local time Monday at a village in Shah Wali Kot district of Kandahar province, the Taliban heartland, after the foreign troops, believed to be the U.S. forces in the region, were attacked by Taliban militants from a mountain behind a house where the wedding ceremony was held. Haji Roozi Khan, owner of the mentioned house, told Xinhua on the spot that the air bombing and firing meant to retaliate on militants who hit the wedding gathering, killing 10 women, 23 children, and four men, all civilians. "The foreign forces' firing lasted until late that night and left another 35 people including the bride wounded," he said. The Xinhua reporter on the scene Wednesday saw many locals there were searching the debris for their relatives' dead bodies. The Afghanistan-based U.S. forces said in a statement it had initiated an investigation into the reported civilian killings and some unit of personnel was dispatched to the site. While congratulating Barack Obama on his victory in Tuesday's U.S. presidential elections, Afghan President Hamid Karzai Wednesday called on the new American leadership to prevent from harming and killing civilians in their military operations in Afghanistan, where 70,000 U.S. and NATO troops are fighting Taliban and al-Qaeda militants. "Our first demand is to avoid harming civilians in Afghanistan," Karzai noted. Civilian killings are sensitive and continuous happenings of this kind in the past years have spurred common Afghans' anger, if not hatred, towards U.S.-led foreign troops and undermined the popularity of the Karzai administration. A statement issued by Afghanistan president's office Wednesday said 40 people were killed and 28 others injured in a coalition forces' airstrike in Shah Wali Kot district. The bloodiest one in years was on Aug. 22 when a U.S. airstrike in Shindand district of western Herat province, according to the UN and Afghan government probe, claimed over 90 civilian lives, which prompted the Afghan cabinet to pass a historic resolution asking for a re-regulation of foreign troops' presence in the war-torn country. 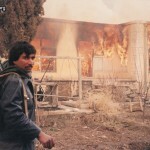 The Afghan authorities had asked the U.S. and NATO troops to stop causing civilian casualties but the Western forces, mostly relying on air bombing to kill insurgents, continued to mis-strike civilian targets, either due to misleading information, aimless firing, or self-protection in cases of so-called "escalation of force." In several cases, the result of the probe done by the U.S. or the NATO forces usually came late and the figure of civilian deaths confirmed by them is much smaller than reported from the locals. Obama, the new U.S. president-elect, has said before that he, if got elected, will send 7,000 more troops to the Afghan battlefield, and he also threatened to launch uni-lateral attacks across the Afghan border, saying, if Pakistan is "unable" or "unwilling" to contain the reported escalating cross-border militant violence. Karzai in his Wednesday talk also demanded a change of strategy of the United States in fighting militants, saying, "The war on terror should be conducted in areas where the sanctuaries of terrorists and their training centers exist." He is apparently referring to the reported militant hideouts in the tribal areas across the Afghan-Pakistani border, which he has noted repeatedly before should be dismantled to end the insurgency and terrorist attacks inside Afghanistan. The U.S. forces in Afghanistan had conducted several bombing attacks into Pakistani soil which was said to target militants but sometimes killed civilians. Saying it has the capability to handle militants on its sovereign soil, Islamabad categorically condemned the U.S. cross-border attacks. WECH BAGHTU, Afghanistan — An Afghan villager at the scene of an apparent U.S. bombing says 23 children and 10 women attending a wedding party are among 37 Afghans killed during a U.S. fight with the Taliban. An Afghan Government investigation has found 37 civilians were killed during a US air strike on a village in the southern province of Kandahar earlier this week. Many of the victims were at a wedding party. The U.S. military says it is investigating the reports but a spokesman said "if innocent people were killed in this operation, we apologize and express our condolences." Kandahar province villager Abdul Jalil says he was hosting a wedding party for his niece when Taliban militants fighting U.S. forces took cover near his home. Jalil says 37 people were killed when U.S. warplanes later bombed the wedding party. An AFP reporter in the main hospital in Kandahar saw women and children being treated for various injuries including burns. Two villagers accompanying them told reporters that dozens of villagers attending the wedding were killed and wounded when military warplanes bombed. 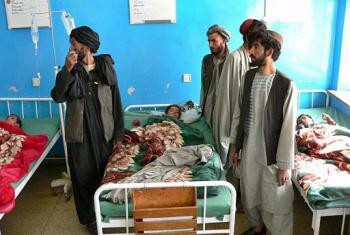 "Taliban attacked the troops. Then the troops bombed our village and killed scores of people. There are still people under rubble," one, named Shah Mohammad, told AFP. This could not be confirmed. There have been dozens of incidents in which international military air strikes against militants have killed and wounded ordinary Afghans, an issue of concern to the government as it tries to win support against a Taliban insurgency. There are currently 18 times as many detainees at Bagram than at the U.S. military prison at the Guantanamo Bay, Cuba, naval base, whose prisoner population has dwindled from a peak of 780 to 170.